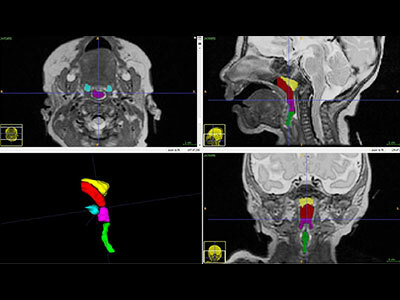 The airway structures of interest to the Children’s National research team included the nasopharynx (labeled red), oropharynx (labeled purple), hypopharynx (labeled green), adenoids (labeled yellow) and tonsils (labeled blue). The team displayed the volumetric imaging in three perpendicular planes and a three-dimensional model. Credit: A. Smitthimedhin, et al, Clinical Imaging. Infants born preterm have significantly lower nasopharyngeal and oropharyngeal volumes, compared with newborn peers carried to full term, and those lower airway volumes are independent of the infants’ gender, ethnicity or weight, according to a study published online Dec. 16, 2017 in Clinical Imaging. According to the Centers for Disease Control and Prevention, 1 in 10 babies born in the United States is preterm, or born prior to the 37th gestational week. Premature birth leaves these children more susceptible to disordered breathing while sleeping, including obstructive sleep apnea (OSA), an ailment characterized by increased upper-airway resistance that narrows airways. “In addition to finding some airway volumes were smaller in preterm infants, our results indicated both sets of newborns had similar hypopharyngeal volumes. This suggests that risk factors that lead to OSA are confined to the uppermost airway and do not appear to be explained by enlarged adenoids and tonsils,” says Anilawan Smitthimedhin, a Children’s National Health System radiology research fellow at the time the study was performed and lead author of the paper. In order to diagnose OSA, clinicians now use bronchoscopy, but the method has limitations, including the need to insert a lighted instrument into the airway, which can affect pressure and resistance within the airway. The Children’s National research team theorized that magnetic resonance imaging (MRI) could offer a non-invasive way to evaluate the upper airway, determine its anatomy and dynamic function, while shielding infants from radiation exposure that can accompany other imaging techniques. They enrolled 96 infants who had undergone brain MRIs as part of an unrelated study about neonatal brain development. The newborns had a range of medical conditions, including suspected hypoxic ischemic encephalopathy, cardiac disease and seizures/movement disorders. Forty-nine of the infants were born preterm; at the time of the MRI, their corrected mean gestational age was 38.4 weeks. Forty-seven of the newborns were born full term; they received MRIs at 1.7 weeks of age. The airway structures of interest included the nasopharynx (the upper part of the pharynx), oropharynx (located at the back of the mouth behind the oral cavity), hypopharynx (the entrance into the esophagus), adenoids and tonsils. The team displayed the volumetric imaging in three perpendicular planes and a three-dimensional model. “Nasopharyngeal volume of full-term infants was 495.6 mm, compared with 221.1 mm in preterm infants. Oropharyngeal volume of full-term infants was 313.6 mm, compared with 179.3 mm in preterm infants,” Smitthimedhin says. Aided by volumetric 3D data that more accurately measures airway and lymphoid tissue, the team proposes to study a larger group of infants to determine whether narrowing of the uppermost airways predisposes very young children to experiencing OSA later in life. “Ultimately, our goal is to incorporate dedicated, dynamic MR imaging of the airway while children sleep, which would provide real-time, detailed information about the changes associated with sleep. This innovation holds the promise of leading to more accurate, non-invasive diagnosis of OSA in infants,” says Dorothy Bulas, M.D., chief of Diagnostic Imaging and Radiology at Children’s National. Children’s National study co-authors include Radiologist Matthew Whitehead, M.D. ; University of Maryland student Mahya Bigdeli; Pulmonologist Gustavo Nino Barrera, M.D. ; Pulmonologist Geovanny Perez, M.D,; and Hansel Otero, who was at Children’s National when the research work was performed but now works at Children’s Hospital of Philadelphia.